First published in 1939, the same year as Joyce’s Finnegan’s Wake, its bars and urban grime – creating a hilarious and irreverent cocktail. 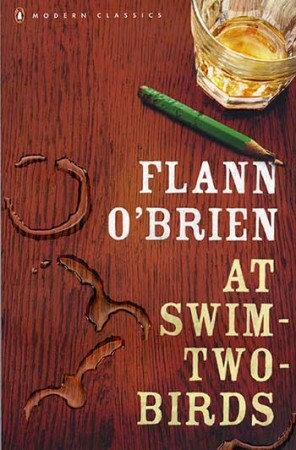 It pokes fun at the work of O’Brien’s Irish near-contemporaries, among them, WB Yeats, James Joyce and Samuel Beckett. Flann O’Brien (real name Brian O’Nolan) was born in 1911 in Co. Tyrone. He graduated from UCD and joined the Civil Service. In addition to At Swim-Two-Birds he wrote The Dalkey Archive, The Third Policeman, The Hard Life and The Poor Mouth – as well as the Cruiskeen Lawn column in the Irish Times under the pseudonym, Myles Na Gopaleen. He died on April 1st, 1966.